In the winter months, most of us find ourselves housebound. This inactivity can throw off our whole system, especially if we’ve been snacking a bit more because of the holidays. Spring is almost here, so why not choose a healthier alternative? PINES Wheat Grass provides green superfoods that not only help cleanse your internal system, but also provide the same significant health benefits of leafy-green vegetables. WebMD states that these foods are “brimming with fiber along with vitamins, minerals, and plant-based substances that may help protect you from heart disease, diabetes, and perhaps even cancer." PINES’ very own “Wheatgrass Girl,” Rachel Cara, is spreading the word about these amazing benefits and juicing up audience members to try for themselves. Cara is an educator and nutritional consultant providing great information and samples of her own “Detoxing Green Juice” to folks across the nation who want to be healthier this winter season. During her sessions, Cara also talks about the many health benefits of PINES superfoods and the different health systems it can support. For a comprehensive list of the many benefits according to WebMD, click here. And, since just one teaspoonful of PINES Wheat Grass powder, dissolved in water or juice, provides the same amount of nutrition as a serving of deep-green, leafy vegetables, this is a great way to amp up your green vegetable intake in a new, convenient and tasty way! It’s easy to see why PINES Wheat Grass is at the top of the list for many seeking a natural detox. Since there are so many other benefits associated with this genuine superfood, it almost seems inconceivable why one would choose an unnatural and less-effective method for detoxing. 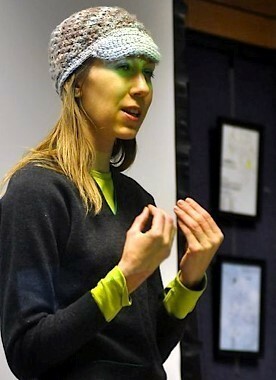 "Wheatgrass Girl" also points out, “Green foods are often used to help diabetics control glucose levels and people who are trying to lose weight…it’s even great for animals!” She recently told one of her groups about her dog, Remi, who was 13 years old and had begun limping and seemed to be near the end of life. 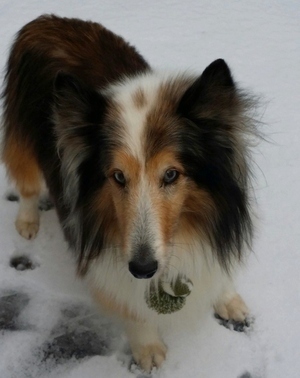 Cara said, when she began feeding it wheat grass, the dog stopped walking stiffly and had more energy and will celebrate its 16th birthday soon! This Spring, enhance your health and mood by adding some PINES to your daily routine. There are many great recipes for smoothies, juices, guacamole dips and even healthy desserts that all happen to taste great. I was sent a jar of Green Duo Capsules to review. I definitely do not get enough leafy greens in my diet and so I was excited to give this product a try. Green Duo is a naturally-concentrated dark green leafy vegetable consisting of the highest quality organic wheatgrass and organic alfalfa. 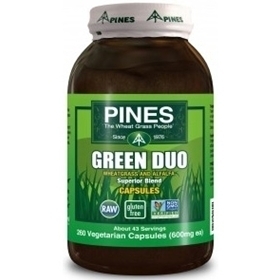 PINES Green Duo is a true blend of these two organic superfoods. My thoughts: I am taking six capsules of Green Duo every day with plenty of water. I have been taking these supplements for about 8 days now. I can definitely see a difference in my health and well-being. One of the first things I noticed was that my vision has improved! This may sound crazy, but I have definitely noticed that my eyesight has become more clear. My skin seems to be looking younger, too. I have also noticed that my stomach is flatter. It looks like a lot of the bloating is gone. My energy levels have increased and I am sleeping better at night, too. And another thing that I have noticed is that my moods have been very stable. PINES Wheat Grass – along with their full product line including PINES Beet Juice Powder, Alfalfa, Barley and much more – is available at premium health and natural retail stores. Click here to find a location near you. PINES products are also available online. Founded in 1976, PINES International (www.wheatgrass.com) is a successful natural products company, still owned by the original founders and families. PINES Wheat and Barley Grass tablets and powders and other premium products are found in over 7,000 health food stores nationwide, and exported to more than 20 foreign countries. PINES products are made with the utmost care, with the focus on creating and maintaining maximum nutritional value every step of the way. Beyond that, their goal is to have minimal negative impact on our environment, and where possible, restore and protect what has been damaged by the shortsighted farming and development activities of others.